It was an ordinary day when Zeke and I stepped into Sabuku Sushi to have lunch and discuss business. We were not prepared with who we encountered. 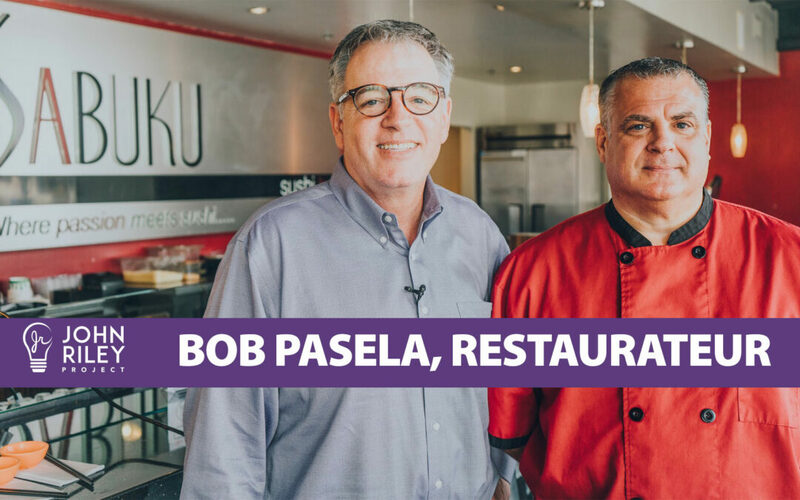 Sabuku Sushi owner Bob Pasela greeted us at our table with a surge of energy and enthusiasm. He showcased his menu, his creative innovations in sushi, his tablet ordering technology and his entire restaurant. Immediately I knew this was someone we needed to interview in a future podcast. This podcast interview with Bob Pasela was so much more than I had originally anticipated. How does a Polish guy from Western Pennsylvania raised on meat & potatoes comfort food end up as a sushi bar owner? Bob Pasela traces his time in San Diego starting as a deep-sea fisherman tasting raw tuna on a fishing boat for the first time. This spark for sushi turned into an obsession of exploring sushi bars, studying the techniques of the top chefs and eventually experimenting with sushi creations at home. His new hobby as a sushi chef turned out to be a hit with this friends as he soon became in demand for private parties. At that point the idea of owning a sushi bar started to become more than just a fleeting wish. It would eventually become a reality. Bob Pasela began his career as a financial advisor with an entrepreneurial streak and a ton of hustle. He was regularly a top performer in securing new clients and helping them grow their investment portfolios. He had seen many clients build business plans for restaurants and knew what it would take to do it himself. So, he eventually took the leap and started Sabuku Sushi. It was remarkable to learn about the challenges he faces as a restaurant owner. Good employees are hard to find. Young people that haven’t figured out their plan in life are easy to hire, but often have no passion for the work and can disappear in an instant. This puts pressure on the entrepreneur as he has to step in to fill the void as a chef, a server, a prep cook, a dishwasher or a bus boy. Plus, as an entrepreneur he is always changing hats from customer service to financial management to marketing to strategic planning. It’s exciting. It’s stressful. It’s rewarding. I was blown away by the amount of money Bob had to spend just to get his restaurant started. After securing the 1500 sq. ft. lease and hiring an architect, he had to pay the City of San Diego $25,000 just to approve his plans. After he made investments in cooking equipment, kitchen resources, restaurant furniture and amenities, he was out of pocket $300,000 before a single customer walked into his door. It takes a special type of business person with tremendous drive and tenacity to overcome these challenges and persevere. No wonder the failure rate of restaurants is so high. Most are not like Bob Pasela and don’t have what it takes to be successful. Bob shared stories of observing other sushi chefs focused on quality, but still largely creating the “same old” offerings for customers. Bob wanted to combine this obsession with quality sea food with his hometown roots in comfort food and do sushi like nobody has ever done it. Ever thought of a sushi roll with bacon? Bob has, and it’s awesome. As an entrepreneur Bob shared some of his challenges running a single restaurant and the difficulty in scaling revenue and production. Bob has since come up with a new “non-restaurant” concept called Munchi Bowl that gives other restaurants the ability to make simple, comfort food menu items in their kitchens during hours when they are underutilized. Munchi Bowl becomes a single online menu combined with an unlimited number of pick up or delivery options depending on the participation of other restaurants in the cooperative business model. This is another example of Bob’s innovative mind seeking ways to offer value to customers while creating business opportunity for his team and others. As an entrepreneur Bob is living his life on his own terms and has the liberty to pursue his own happiness. It’s not easy, but it’s his passion and he is loving it.